FACT # 1. 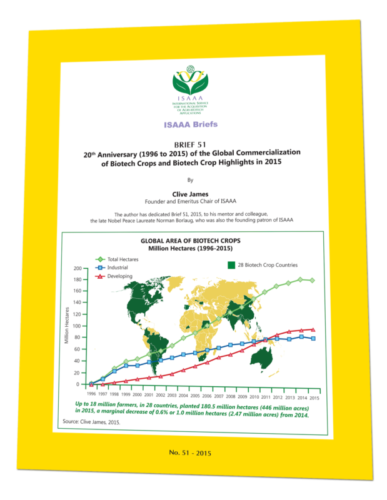 2015 marked the 20th year of the successful commercialization of biotech crops. An unprecedented cumulative hectarage of 2 billion hectares of biotech crops, equivalent to twice the total land mass of the US (937 million hectares), were successfully cultivated globally in up to 28 countries annually, in the 20-year period 1996 to 2015; farmer benefits for 1996 to 2015 were conservatively estimated at over US$150 billion. Up to ~18 million risk-averse farmers benefitted annually, of whom, remarkably, 90% were small, resource-poor farmers in developing countries. FACT # 2. Progress with adoption in the first 20 years. Following a remarkable run of 19 years of consecutive yearly growth from 1996 to 2014, the annual global hectarage of biotech crops peaked at 181.5 million in 2014, compared with 179.7 million hectares in 2015, equivalent to a net marginal year-to-year decrease of 1.0% between 2014 and 2015. Some countries increased their total plantings, whilst others reduced their hectarage principally due to the current low prices of commodity crops; these hectarage decreases are likely to revert to higher hectarage levels when crop prices improve. The global hectarage of biotech crops increased 100-fold from 1.7 million hectares in 1996 to 179.7 million hectares in 2015, making biotech crops the fastest adopted crop technology in recent times. FACT # 3. For the 4th consecutive year, developing countries planted more biotech crops. In 2015, Latin American, Asian and African farmers collectively grew 97.1 million hectares or 54% of the global 179.7 million biotech hectares (versus 53% in 2014) compared with industrial countries at 82.6 million hectares or 46% (versus 47% in 2014); this trend is likely to continue. Of the 28 countries planting biotech crops in 2015, the majority, 20, were developing and 8 industrial. FACT # 4. Stacked traits occupied ~33% of the global 179.7 million hectares. Stacked traits are favored by farmers for all 3 major biotech crops. Stacked traits increased from 51.4 million hectares in 2014 to 58.5 million hectares in 2015 – an increase of 7.1 million hectares equivalent to a 14% increase. 14 countries planted stacked biotech crops with two or more traits in 2015, of which 11 were developing countries. Vietnam planted a stacked biotech Bt/HT maize as its first biotech crop in 2015. FACT # 5. Selected highlights in developing countries in 2015. Latin America had the largest hectarage, led by Brazil, followed by Argentina. In Asia, Vietnam planted for the first time, and Bangladesh’s political will advanced planting of Bt eggplant and identified Golden Rice, biotech potato and cotton as future biotech targets. The Philippines has grown biotech maize successfully for 13 years, and is appealing a recent Supreme Court decision on biotech crops, whilst Indonesia is close to approving a home-grown drought-tolerant sugarcane. China continues to benefit significantly from Bt cotton (US$18 billion for 1997 to 2014), and notably ChemChina recently bid US$43 billion for Syngenta. In 2015, India became the #1 cotton producer in the world, to which Bt cotton made a significant contribution – benefits for the period 2002 to 2014 are estimated at US$18 billion. Africa progressed despite a devastating drought in South Africa resulting in a decrease in intended plantings of ~700,000 hectares in 2015 – a massive 23% decrease. This underscores yet again the life-threatening importance of drought in Africa, where fortunately, the WEMA biotech drought-tolerant maize is on track for release in 2017. Sudan increased Bt cotton hectarage by 30% to 120,000 hectares in 2015, whilst various factors precluded a higher hectarage in Burkina Faso. In 2015, importantly, 8 African countries field-tested, pro-poor, priority African crops, the penultimate step prior to approval. FACT # 6. Major developments in the US in 2015. Progress on many fronts including: several “firsts” in approvals and commercializations of “new” GM crops, such as Innate™ potatoes and Arctic® Apples; commercialization of the first non-transgenic genome-edited crop, SU Canola™; first time approval of a GM animal food product, GM salmon, for human consumption; and increasing R&D use of the powerful genome editing technology, named CRISPR (Clustered Regularly Interspersed Short Palindromic Repeats); high adoption of first biotech drought tolerant maize (see below). Dow and DuPont merged to form DowDuPont. FACT # 7. High adoption of the first biotech drought-tolerant maize planted in the US. Biotech DroughtGard™ maize, first planted in the US in 2013, increased 15-fold from 50,000 hectares in 2013 to 810,000 hectares in 2015 reflecting high farmer acceptance. The same event has been donated to the public-private partnership WEMA (Water Efficient Maize for Africa), aimed at the timely delivery of a biotech drought tolerant maize to selected countries in Africa by 2017. FACT # 8. Status of biotech crops in the EU. The same five EU countries continued to plant 116,870 hectares of Bt maize, down 18% from 2014. Hectares decreased in all countries due to several factors including, less maize planted, disincentives for farmers with onerous reporting. FACT # 9. Benefits offered by biotech crops. A global meta-analysis of 147 studies for the last 20 years reported that “on average, GM technology adoption has reduced chemical pesticide use by 37%, increased crop yields by 22%, and increased farmer profits by 68%” (Qaim et al, 2014). These findings corroborate results from other annual global studies (Brookes et al, 2015). From 1996 to 2014, biotech crops contributed to Food Security, Sustainability and the Environment/Climate Change by: increasing crop production valued at US$150 billion; providing a better environment, by saving 584 million kg a.i. of pesticides; in 2014 alone, reducing CO2 emissions by 27 billion kg, equivalent to taking 12 million cars off the road for one year; conserving biodiversity by saving 152 million hectares of land from 1996-2014; and helped alleviate poverty for ~16.5 million small farmers and their families totaling ~65 million people, who are some of the poorest people in the world. Biotech crops are essential but are not a panacea – adherence to good farming practices such as rotations and resistance management, are a must for biotech crops as they are for conventional crops. FACT # 10. Future Prospects. Three domains merit consideration. Firstly, high rates of adoption (90% to 100%) in current major biotech markets leave little room for expansion; however, there is a significant potential in other “new” countries for selected products, such as biotech maize, which has a potential of at least ~100 million hectares globally, 60 million ha in Asia (35 million ha in China alone), and 35 million ha in Africa. Secondly, there are more than 85 potential new products in the pipeline now being field-tested, the penultimate step to approval. They include the WEMA-derived biotech drought tolerant maize expected to be released in Africa in 2017, Golden Rice in Asia, and fortified bananas and pest resistant cowpea look promising in Africa. Institutionally, public-private partnerships (PPP) have been successful in developing and delivering approved products to farmers. Thirdly, the advent of genome-edited crops may be the most important development identified by today’s scientific community. A recent and promising application is the powerful technology, named CRISPR. Many well-informed observers are of the view that genome editing offers a timely and powerful unique set of significant comparative advantages over conventional and GM crops in four domains: precision, speed, cost and regulation. Unlike the onerous regulation that currently applies to transgenics, genome-edited products logically lend themselves for science-based, fit-for-purpose, proportionate, and non-onerous regulation. A forward-looking strategy has been proposed (Flavell, 2015) featuring the troika of transgenes, genome editing and microbes (the use of plant microbiomes as a new source of additional genes to modify plant traits) to increase crop productivity, in a “sustainable intensification” mode, which in turn can viably contribute to the noble and paramount goals of food security and the alleviation of hunger and poverty.